Logitech recently announced at this months CeBIT, that new Headsets were on the horizon. 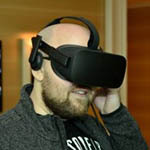 We are reviewing their top model, the Premium USB Headset 350, which they promise to provide superior input and output sound, and great comfort. How does it do? Check out our review. 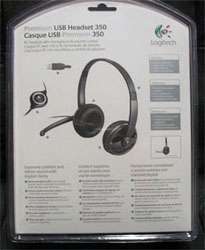 At this months CeBIT, in Hannover, Germany, Logitech announced the introduction of three new Headsets; Premium Stereo Headset, USB Headset 250 and the Premium USB Headset 350. You may be asking, “Why 3, and what’s the difference?” The primary differences are not just sound quality, but construction and design, as well. The better the model, the better the design, and the more ‘comfortable’ it looks to be. 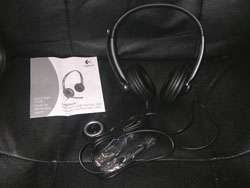 The Premium Stereo Headset is the only one of the three that uses the standard Audio Jacks for input and output. 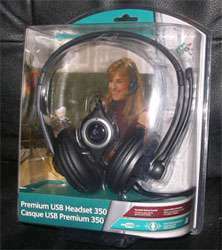 The 250 and 350 models use one USB port. The main differences between the 250 and 350, are that the 350 have “Plush” ear pads, compared to the 250 which uses “Leatherette” ear pads. The Premium 350 also uses 40mm neodymium drivers, which deliver crisper, cleaner sound. Therefore, the sound with the 350 should be more clear, clean and accurate.. especially in gaming. That all being said, we are reviewing the Premium 350 Headset in this review, so let’s jump right onto the products features.